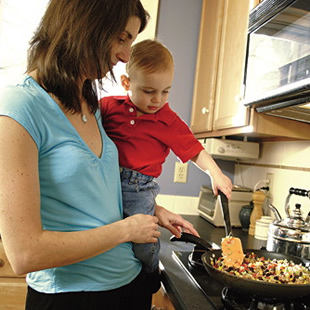 Expert advice on helping kids stay healthy through healthy eating and healthy cooking. Whether you're pregnant or already have kids, these questions and answers about how to feed kids will give you helpful tips on keeping your children healthy. I'm pregnant and plan to breastfeed. Can what I eat affect my baby's food preferences later on? If you want your child to develop a taste for healthy foods, you can start right now during your pregnancy by eating them yourself. Food chemicals with distinct tastes and smells are transmitted to the amniotic fluid that cushions a growing baby; the fetus swallows this fluid and can sense the flavors. Infants are exposed to flavors through breast milk, which reflects the flavors of foods, spices and beverages in mothers’ diets. And studies suggest that babies can develop a taste for those familiar flavors when they’re exposed to them later on in solid foods. Julie Mennella, Ph.D., a scientist at the Monell Chemical Senses Center in Philadelphia, conducted a study in which pregnant women planning to breastfeed were randomly assigned to one of three groups. Women in all groups consumed 1¼ cups of carrot juice or water four days a week for three consecutive weeks during the last trimester of pregnancy and again during the first two months of breastfeeding. One group consumed carrot juice during pregnancy and water during lactation. Another group, the reverse (water, then carrot juice). The third group drank water both times. Later, when it came time to introduce the infants to solid foods, the researchers observed the babies as they were fed cereal prepared with water on one occasion and cereal made with carrot juice on another. After each feeding session, the scientists also asked the mothers to rate their babies’ enjoyment of the cereal. When fed the carrot-flavored cereal, infants whose mothers had drunk the carrot juice while pregnant or breastfeeding displayed fewer negative facial expressions—the infant equivalent of “What’s that weird stuff?”—than the babies whose mothers had sipped water. These infants also appeared (according to their mothers, who were unaware of the scientists’ research question) to enjoy the carrot-flavored cereal more than the one made with water. “Prior exposure to the carrot juice made the taste familiar, and therefore more acceptable,” says Mennella. We try to sit down to a family dinner every night, but our schedules are so crazy it rarely happens. How can I get the whole family together? There’s no denying that sticking to a regular family dinner schedule is tough, with parents balancing work schedules with their children’s after-school activities—but it’s worth the effort, says William Doherty, Ph.D., director of the Marriage and Family Therapy Program at the University of Minnesota. When Doherty’s colleagues at the university’s Center for Adolescent Health and Development surveyed 4,746 middle school and high school students for Project EAT (Eating Among Teens), they found that the kids who sat down to meals most often with their families—seven or more times weekly—tended to have higher grade-point averages and were more well-adjusted in general than those who ate the fewest family meals (two or fewer per week). They were less likely to feel depressed or suicidal, to smoke cigarettes or use alcohol or marijuana. Other studies have found that children who eat regular meals with their families also eat more healthfully in general, taking in more fruits and vegetables and calcium-rich foods, fewer soft drinks and snack foods. They may also have a lower risk of disordered eating, with fewer reports of extreme weight-loss diets or binge eating in kids whose families placed a high priority on regular family meals. Why? Family meals give parents an opportunity to model good eating habits—and to show kids what a “normal” meal might look like (unlike the French fries/hot dog/soft drink combo they might otherwise choose). And parents are better able to spot potential eating problems if they’re facing them right across the table. Mealtimes are also critical for connecting, says Doherty. “It’s one of the few opportunities families have to be together as a group, sharing in conversation,” he says. Keep trying. If you’re not used to regular dinners, expect some initial awkwardness. “Like exercise, the benefits will accrue only if you stick with it,” says Doherty. No time to cook family dinner? Try breakfast or lunch, use take-out or go to a restaurant. What’s being served isn’t as important as the fact that you’re together. How do I help my overweight child lose weight healthfully? My kids are always asking me for things they see on TV or that they see their friends eating. How can I deal with this? The best way to teach your child that healthy foods are important is to eat them yourself. In other words, show him, don’t just tell him. In a study published in the Journal of the American Dietetic Association, researchers showed that parents who ate lots of fruit and vegetables generally had daughters who consumed plenty of produce, too, whereas parents who pushed fruits and vegetables but ate few servings themselves tended to have daughters who had low intakes of fruit and vegetables. In addition to preferring foods that are familiar, children also learn to prefer foods that are presented as acceptable in their homes. During early childhood one begins to associate both positive and negative experiences with particular foods. Offering a child a certain food as part of a fun celebration or ritual (e.g., birthday cake) enhances his preferences for that food. On the other hand, insisting that a child eat something in order to get a reward—“Finish your peas and then you can watch television”—usually creates a negative food association. Although possibly effective in the short term, over the long haul this will backfire because bribing your child to eat something tends to reinforce the negative association with that food.